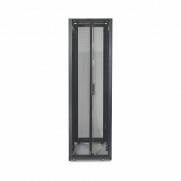 Rack enclosures with advanced cooling, power distribution, and cable management for server and networking applications in IT environments. Includes: Casters, Doors, Key(s), Leveling feet, Roof, Side Panels, User Manual. -Rack enclosures with advanced cooling, power distribution, and cable management for server and networking applications in IT environments. -Includes: Baying hardware, Documentation CD, Key(s), Leveling feet, Mounting Hardware, Pre-installed casters, Side Panels, User Manual.-Adjustable mounting depth. -Cable access. -Multi-vendor equipment compatibility. -Numbered U positions. -Protective grounding provisions. -Removeable reversible fully ventilated doors. -Simple baying installation. -UBC Zone 4 stabilization provisions.